Transport Ideally located in the heart of Kensington. Nearest tube is High Street Kensington which is a few minutes walk. London Heathrow Airport, 30 minutes. London Gatwick Airport, 60 minutes. M25 orbital Motorway, 30 minutes. M4 Motorway, 15 minutes. Description The award-winning, 831 bed roomed Copthorne Tara has an enviable reputation for its high standards of comfort and impeccable service. 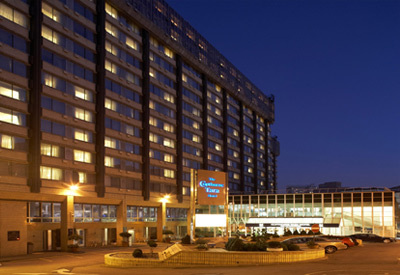 A fine, modern, 4-star hotel in a quiet corner of fashionable Kensington, it's ideal for enjoying the best of London. The hotel also has a fresh air climatisation system. There is 24 hr room service and a Business Centre. Areas close by include Knightsbridge, Chelsea, Earl's Court and local attractions include Kensington Palace and Gardens, Victoria and Albert museum, Commonwealth Institute etc. Our Comments The Copthorne Tara Hotel is very popular throughout the year and has been a favourite with tourists and families for many years. This 4 star deluxe hotel is centrally located in a desirable and fashionable residential area of London and we recommend it highly.